Rainy Days and Mondays Always Get Me Down . . .
Well, not really. But when the rain hangs around for days and days, then I become lethargic and “dull.” And today just happens to be Monday so on THIS Monday, the rainy day after so many other rainy days is getting me down. The entire month of September was rainy and now that we are into October, the rain continues. If I could sing worth a lick, I’d be singing the blues. Better yet, if I could send some of this rain to my friends who desperately need it in Texas I would. During the afternoon hours there was a lull in the weather. Skies were still overcast, and drizzle permeated the air, but the rain ceased for a bit. I needed to get out of the apartment so camera in hand, I took a wet walk around the complex before the rain began in earnest again. For about an hour I wandered around the building shooting the wet autumn beauty. Chilly though it was, the rain drops accentuated the rich colors of Autumn that are beginning to emerge. Everywhere I looked there was exquisiteness. Next And the Good News Is . . .
Hmmm. All those leaves getting baptized. Well I certainly hope they are good Presbyterian leaves and not Baptists or Methodists. I have some Presbyterian friends so that’s cool. But then I have Baptist and Methodist friends, too. What to do????? LOL. Hope you enjoyed the slide show. Thanks for stopping by. Ooooh! Ahhhh! Gorgeous photos! The slide show is wonderful. Cecelia, your first slide show is very nice. Very nice, indeed. There is something peaceful about raindrops when they are photographed. Thank you Barbara. I was going for peaceful, mindful, so I’m glad that is the feeling you got. Thanks as always for stopping by. I’m glad you like the photos Jeanne. Yes, the colors in northeast Ohio are very much like New England. I lived in New Hampshire for a year long ago but still have very fond memories of it, and of the gorgeous falls! Hello Mrs..How is your Dad? I loved the pictures just as they are as I could not find the link to the slide show . However I enjoyed it just as much, such beautiful colours..well done little sunshine. When I went to Barbados on holiday they called the rain ‘liquid sunshine’ maybe that would work for you. Thanks for asking about Dad. He is improving daily and is now in rehab. We nearly lost him but thankfully he beat the odds! I am happy that you like the photos and sad that you did not see the link. I’m glad you like what you saw, though. If you want to try again, the link is in blue right above the large photo at the end of the blog. Good Luck! Thanks SIG. I am glad you like it. I was surprised at how much I enjoyed getting out in wet weather with a camera, and equally (if not more) surprised at how well the photos turned out! Thanks for stopping by. Beautiful shots, Cecelia. I like the occasional rainy day . . . but not day after day of sodden skies. Thanks Nancy. Thankfully the sun is shining today and the forecast for the rest of the week looks great! Hello, Cecilia. I’m long overdue to make an appearance here. We’ve been in California for forty years and I love it here … but I miss the autumn, especially the autumn leaves (my wife and I are from Connecticut). Thank you for sending them my way. Love the music, by the way … acoustic guitar and particularly Flamenco are one of my favorites. I am so happy you stopped by, and glad to send the “New England” look of fall your way. This is my first Autumn in Northeast Ohio and it is beautiful. We have a few more weeks of color I think. This was my first slide show~ever~and the program I used gave me limited choices of music. I am sooooo glad they had the guitar and Flamenco. It was the only one that really fit the mood of the photos. Thanks for stopping. Have a great evening. Hi Cecelia! I hope you had a great holiday! I love the new look of your blog and the awesome pictures. Our holidays were very nice, thank you. And I’m glad you like the new look of my place! 🙂 Thanks for stopping by. Beautiful “wet” shots. 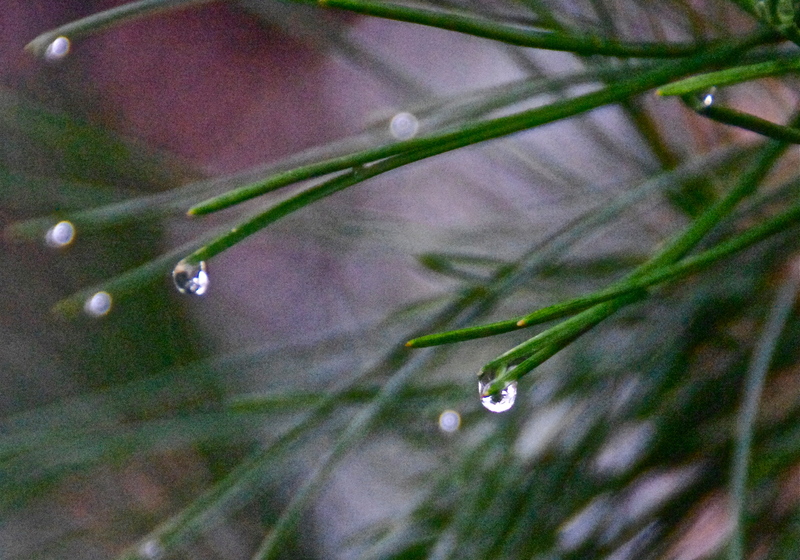 I especially love the pine needles with the raindrops and all the stunning red leaves. Slide shows are so much fun. That is a gorgeous, wonderful slide show. The colors and compositions are stunning. I enjoyed the music too. I’m glad you like the show! 🙂 Yes, I’ve been out several times already today and am thoroughly enjoying the sun. 🙂 Thanks for stopping by. Thanks for stopping by whitemarz. I don’t know about the theater, but after a while I do get tired of the rain! Good Morning Cecelia! Your rainy day photos and slideshow are very pretty and peaceful this morning. You captured some beautiful bokeh on quite a few shots. Nice start to my Thursday morning! Fall leaves clinging to rainy droplets and not wanting to let them go. Hard to beat! Enjoy your Thursday Cecelia! I wish I could have. Now that the sun is shining and the rain has gone, at least for a while, we are able to get out and enjoy the weather. I have blogging buddies in TX and in areas in Europe that are hurting. My heart goes out to all, and hopefully if it hasn’t happened already, those who need it will get the rain. oh Cecelia, that was sheer eye and ear candy……. and so high-tech with music and all. seems a bit daunting for me, but maybe one day i will get there, too. thank you for sharing this wonderful gift for the senses. Thank you P&K. This was one of those projects that came together almost on its own. The photographs surprised me, and the music (I was given a wide range of choices) fit perfectly. I encourage you to give it a try. It is a lot of fun and you might be surprised how well it turns out. Your photography is a lot candy for the eyes, too! Oh I can feel how you feel these days..Its raining also here in the Philippines.During this month up to February is what we call wet season..By the way savor and just enjoy it this season there’s a lot of exciting things to do even its raining..hehehe.. I love the shots..It was so refreshing and so cool to the eyes..
Beautiful photos! I hope you’re printing some of them out so that in a few months you won’t forget them after they’ve found their way to the bottom of the digital drawer. These are keepers! 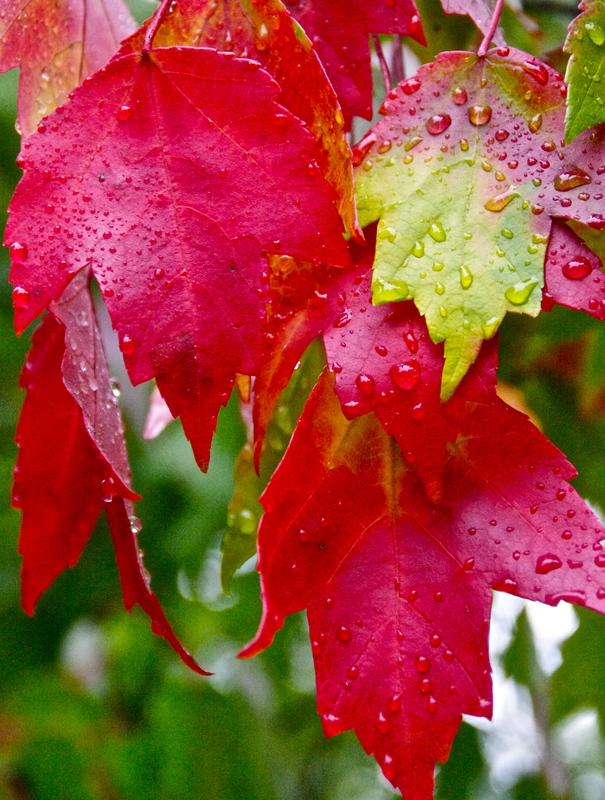 It looks like you have captured autumn in the Northwest, where that mean colors and rain. Beautiful photos, Cecelia. Great slide show. Oh so very lovely. I love rainy days! I know. 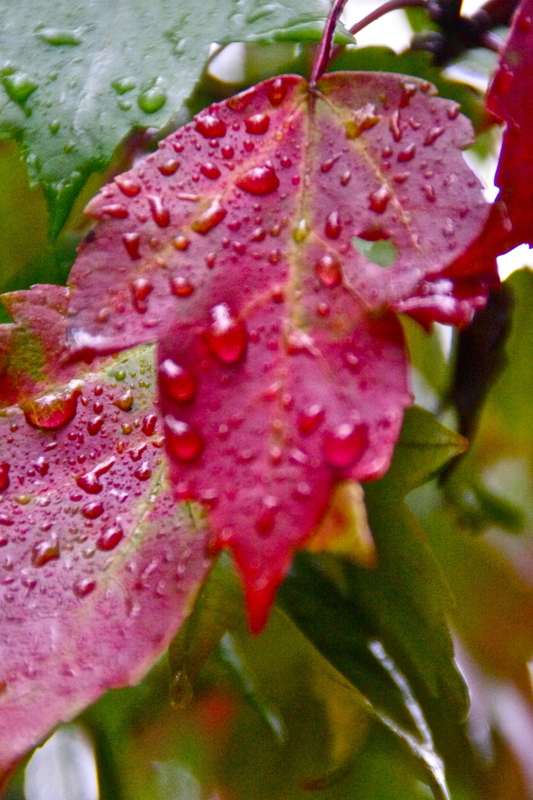 Some of my best photography, not just these leaves, has been shot on rainy days.